Optional Grout Version - thicker than the Resin Version, a darker Grey, slower to pour and level. Sizes - 1 litre, 2.5 litre and 7.5 litre tubs. 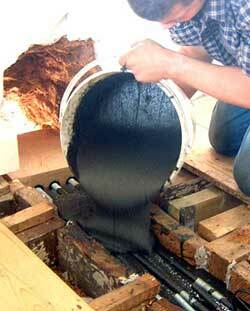 Two versions - Resin or Grout - supplied as three part, thick porridge like pouring resins (two liquids and a powder). Mixing Structural Pouring Resin with a Mixing Paddle - it will self-level. Mixing - mix using a paddle in an electric drill. Usage rate - by volume - 1 litre will fill a void 100mm x 100mm x 100mm (4" x 4" x 4"). A hole 300mm x 300mm x 300mm (1ft x 1ft x 1ft) will require 27 litres. 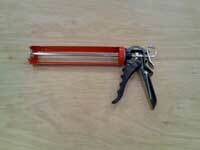 Frequently purchased with this product - Mixing Paddle, 1 litre Cartridge Tube Kit, 1 litre Professional Skeleton Gun. For the thicker Grout option call us on 01626 331351 to discuss your application - we'll help you choose the correct product. 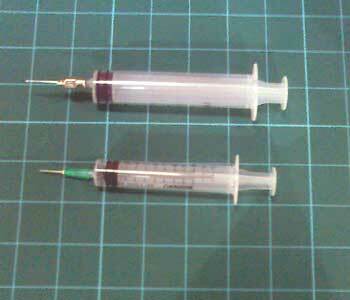 A two part, (two gels) thick injection resin. 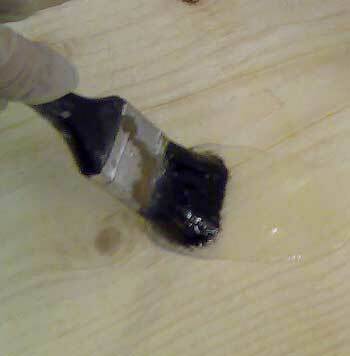 This resin does not drip or run - it is similar in consistency to Vaseline or Swarfega. Brightly coloured base allows easy mixing. 1. 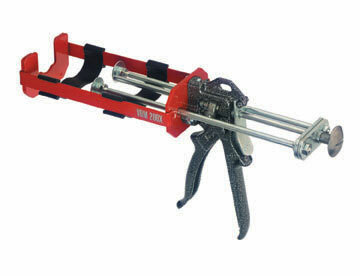 For injecting into cracks, slots and holes, when used with a Cartridge Tube Kit. 2. For laminating and bonding materials together, by spreading. 3. For MOT Brake Roller re-coating, in combination with our Grits. 4. 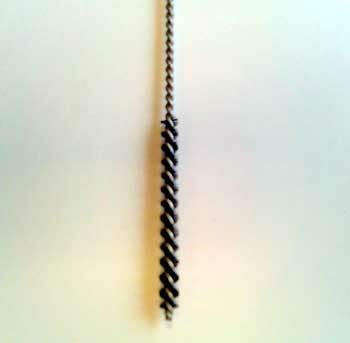 In combination with reinforcement rods, for structural repair of timber and masonry, including concrete. 5. 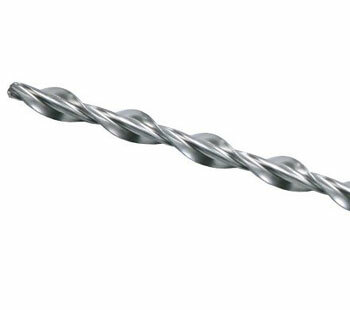 As an anchor resin, to bond rods, studs, bolts and reinforcement into masonry and concrete. Mixing - mix using a pallet knife, by hand. Usage rate - by volume - 1 litre will fill a void 100mm x 100mm x 100mm (4" x 4" x 4"). A 400cc pack will fill a hole 25mm in diameter to a depth of 800mm. Extension tubes are available, made to order, to reach the base of any hole depth and in varying diameters. Frequently purchased with this product - Mixing Knife, 400cc Cartridge Tube Kit, 400cc Skeleton Gun, 1 litre Cartridge Tube Kit, 1 litre Skeleton Gun, Vinyl Gloves (Box of 100). Note - both sizes of Thixotropic Resin require a Cartridge (at extra cost), if being used for injection, rather than spreading. Click here to go to Cartridge Tubes Section, if you need to inject the product. Mouldable Epoxy Putty - mixing wearing Gloves - colour with our Powder. 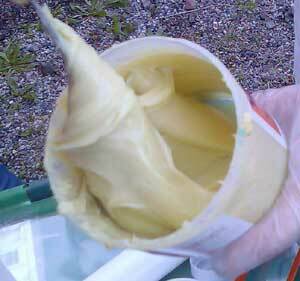 Keep the Pots at room temperature for some hours before mixing - cold putty is hard on the knuckles. Uses - fills and structurally repairs wood, brick, stone, concrete, some plastics and bonds most metals. Will set underwater. 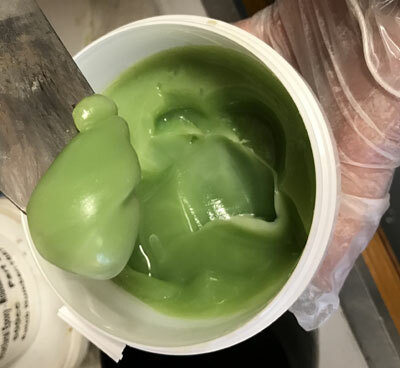 Mixing - simply take equal portions in gloved hands and mix together, like window putty or bread dough, until a perfectly even colour. Apply with a pallet knife or by hand placing. Do not mix more than you can place and shape in 10 - 15 minutes. This is a reasonable handful to mix. 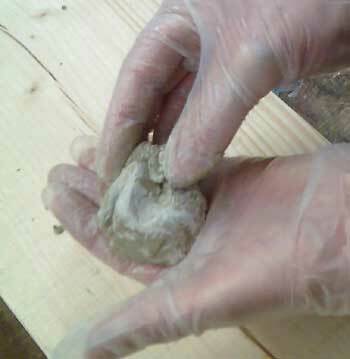 Usage rate - 1 litre of putty will fill a hole 4 inches x 4 inches x 4 inches (100mm x 100mm x 100mm). Frequently purchased with this product - Colour Powder, Colour Pugment, Vinyl Disposable Gloves (Box of 100 uni-handed Vinyl), Epoxy Cleaner for Tools, Epoxy Primer/Consolidator. Apply Rebuild Resin with a Pallet Knife. Uses - repair window frames, door frames, timber frames or other wooden structures.. Can be used as an adhesive to bond timber pieces into frames. 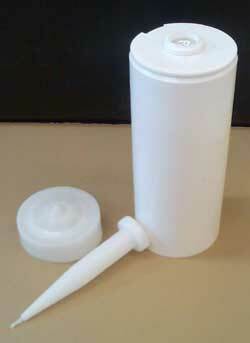 Mixing - this filler/adhesive consists of two soft, creamy materials, gunned to give a perfect mix ratio. Mix with a putty knife. There is no shrinkage and it is totally waterproof. This is a professional repair material, as used by window frame repair specialists. 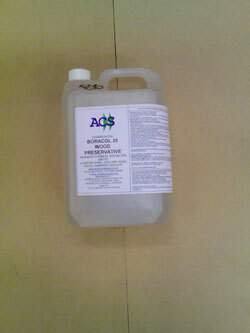 Frequently purchased with this product - Pallet Knife, Vinyl Gloves, Epoxy Primer, Epoxy Cleaner/Remover. Using a Skeleton gun gives a precise dispensing ratio for consistent results. Finish the job off with our Boron Paste and Boron Rods - these provide internal rot and insect attack protection by dissolving inside the timber. See our Boron Shop for details. Uses - Epoxy Primer should always be used before applying Mouldable Epoxy Putty onto smooth timber, planed timber, hardwoods, stone, brick, concrete or render. However, on rough or well dugout softwood timber it is not strictly required. Ensure that ALL rotted wood is cut out completely. Filling over rot is a waste of money. Mixing - mix the two liquids thoroughly together in the ratio 2 Base to 1 Activator until a perfectly even colour. Pour into another clean container and re-mix. Apply with a brush, or by pouring. Usage rate - 1 litre of Epoxy Primer will cover 1 square metre at a thickness of 1mm, or about 6 square metres at a normal paint film thickness. Frequently purchased with this product - Vinyl Disposable Gloves (Box of 100 uni-handed), Syringes. Sizes - 10cc, 20cc and 50cc. Outlet outside diameter 4mm. 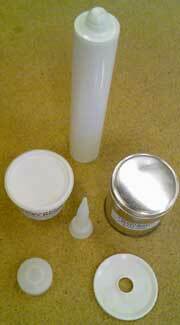 Measuring - for dosing liquid Epoxies, such as Epoxy Primer, to maintain the correct mix ratios (keep one syringe with each part - Activator and Base). Injecting - for injecting liquid and Thixotropic Epoxies, such as Epoxy Primer or Thixotropic Injection Resin, into small holes in order to fill fine cracks or hollow sections behind cracked plaster, render or tanking. 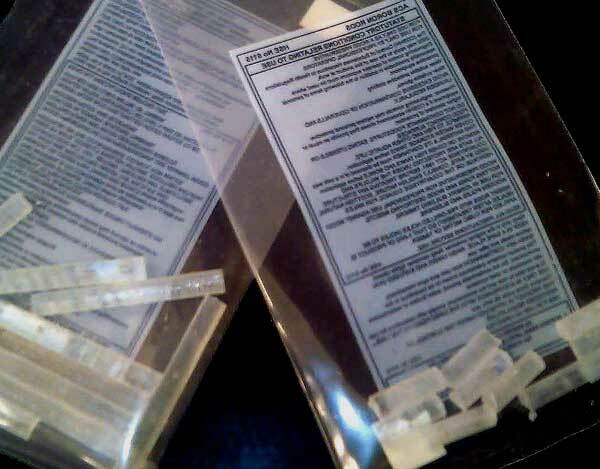 Needles available for 10cc and 20cc. Uses - reinforcement of timber beams, brick, concrete and stone structures. Available in 6mm and 8mm diameters, 1 metre or 7 metre lengths. Each 1 metre length will make one typical brickwork or blockwork 'stitch'. Also available in 7 metre coils. Uses - these Cartridge Kits are supplied empty ready to hand fill with our Structural Epoxy Pouring Resin (by pouring) or with our Thixotropic Injection Resin by using the 'pusher plate' supplied with the Kit. Filling - the pusher plate drops into the pot containing the mixed resin and allows the open end of the tube to be pushed down into the pot, filling itself as it goes down. Frequently purchased with this product - 400cc or 1000cc Skeleton Gun, Extension Injection Tubes - ring us to discuss your exact requirements. You can specify the length of extension tube that you require. (Other sizes - specially made to order). Needle tip is 2mm in outer diameter. Uses - these Cartridge Kits are supplied empty ready to hand fill with our Thixotropic Injection Resin Slow Set by using the 'pusher plate' supplied with the Kit. Filling - ensure that the Resin has been stored at room temperature (15 to 20C) for at least 4 hours before use. The pusher plate drops into the pot containing the mixed resin and allows the open end of the tube to be pushed down into the pot, filling itself as it goes down. Uses - to extend the Cartridge Nozzle so that holes can be injected with resin correctly - from the hole base outwards. This minimises the risk of air voids within the resin, a cause of bond weakness. 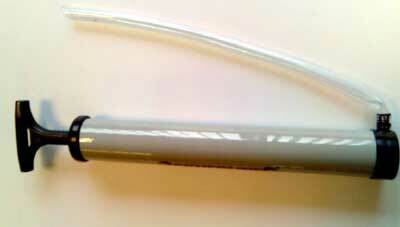 Sizes - to fit either the 400cc or 1000cc Cartridge Tubes, with differing length extensions to suit the hole depth. Specials - we can fit varying lengths of tubing to the threaded adapters to suit your job. Please call us on 01626 331351. The Diameter given is the outer dimension (OD). 1000cc Skeleton Gun - Special 1 Litre gun for injection using UltraCure 1000cc or other 1 Litre products. 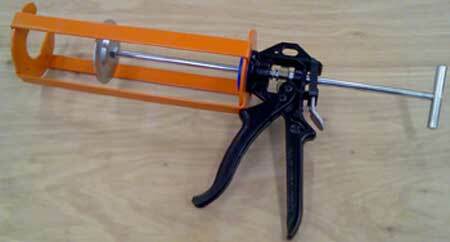 380cc 1:1 to 3:1 Skeleton Gun - gun for injecting Pure Epoxy Resin and similar side by side resin cartridges. To fit most standard sealant cartridge tubes, short and long, professional quality. For the fatter, 1 litre cartridge tube only. For Epoxy Resin cartridge tubes, having equal sized pistons for 1:1 and 3:1 mixes. 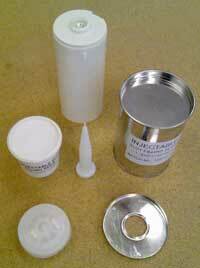 Uses - add to Mouldable Epoxy Putty, Thixotropic Injection Resins. This colour can be modified using either Pigment dissolved in Epoxy Resin or Powders. Minimal smell, non-flammable, clear solvent - can be used to dilute Epoxy Resins (up to a maximum of 5%) and for smoothing Epoxy filled surfaces. 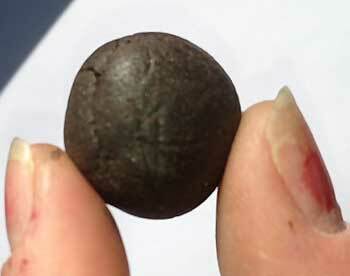 Size - 275mm long, minimum hole diameter 5mm. 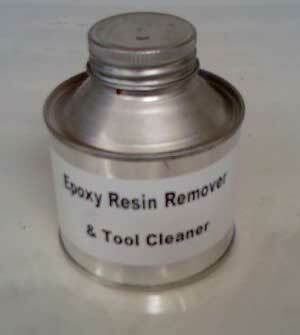 Uses - for cleaning out holes and slots prior to resin injection, in order to removed loose material and dust. Use the Hole Cleaning Pump to finish dust removal. Uses - for blowing out holes and slots prior to resin injection, in order to removed loose material and dust. Use the Hole Cleaning Brush first. 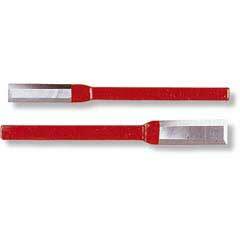 All Metal Chisels, made of solid steel, can be used with lump hammers and as levers, to clean out slots and tidy up previously roughly cut out cavities in wood. For repairing timber beams, lintols, rafters, tie beams, carrier beams, joists and bressumers. These bespoke beam kits contain a new, laminated structural timber, made in kiln dried wood to C24 Grade or higher, fitted with connector bars made from zinc plated 8.8 Grade High Tensile Allthread bar. Pouring or injection resins are also included. Engineering - free Design, Method Statement and Tools List (Hire available). For DIY amateur and professional use when pre-diluted in water to a 5% solution. 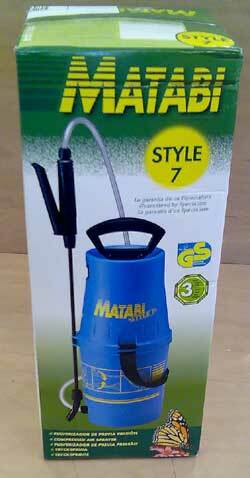 Available in heat sealed plastic bags or in plastic bottles, ready to add water. Boron Ultra 12 Powder is supplied for dilution in water at 5% for Woodworm Treatment. Apply by brush or sprayer. Non-staining and only 1 hour re-entry. It has no smell and no vapour. Woodworm and rot treatment without the unpleasantness. 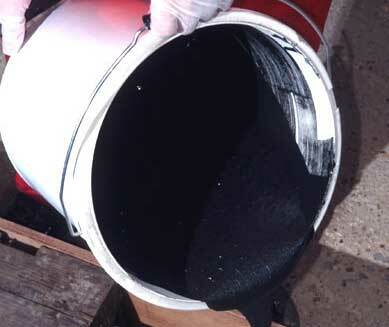 Usage rate - wearing a dust mask, gloves & splash protection mix 1kg of powder with 25 litres of water for treatment of light to medium woodworm infestations, or Dry rot. Apply at an average rate of 4 square metres per litre, until wet, but not dripping. Apply two coats, for Woodworm treatment and four coats for Dry Rot treatment, allowing surfaces to dry in between coats. Boron Ultra 12 - 5 litres and 25 litres - diluted in water to make a 5% solution. A pre-diluted 5% solution for DIY, amateur and professional use. Boron Ultra 12 diluted in water. Apply by brush or sprayer. Non-staining and only 1 hour re-entry. It has no smell and no vapour. Woodworm and Rot treatment that is convenient and nice to apply. No added chemicals, no solvents. Usage rate - for treatment of light to medium woodworm infestations. Apply at an average rate of 4 square metres per litre, until wet, but not dripping. 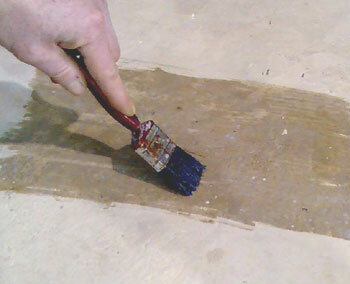 Apply two coats, for Woodworm treatment and 4 coats for Dry rot treatment, allowing to dry in between. - 5 litres will cover about 10 square metres, with two coats. 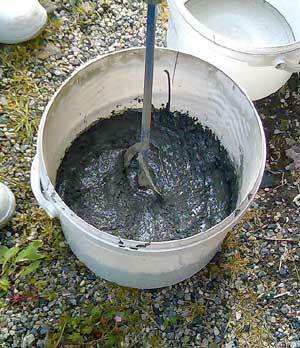 - 25 litres will cover about 50 square metres, with two coats. Ready to Use solutions for rot, mould, algae. Boracol 5RH - for Amateur and DIY use. Boracol 10RH and Boracol 20 - for trade professional use. Including Decking, Patios and Yacht Decks. Special Applications - give Kathy, David or Angela a call on 01626 331351 to discuss your woodworm treatment problem - Boracol may be the answer. Hallberg Rassey, fine Scandinavian Yacht Builders, recommend Boracol 10RH for all professional treatment of teak decking. Boracol 10RH and Boracol 5RH can be brushed or sprayed, but Boracol 20 can only be brushed, unless you use one of our special Microblower Machines, because it is a viscous liquid. These Microblowers can be hired from us. We can also supply 1 litre and 2.5 litre containers of Boracol 5RH and Boracol 10RH - call 01626 331351 for prices. 1. Special Application - Boracol 10RH and Boracol 5RH - where a combined Insecticide, Fungicide and Mouldicide is required and water is acceptable as a carrier. 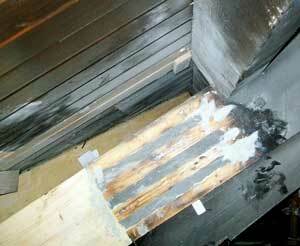 Examples - yacht teak decks, roof timbers with mould and insect attack, mould affected sub-sites after flooding. 2. Special Application - Boracol 20 - where a combined Insecticide, Fungicide and Mouldicide is required and water is undesirable as a carrier. Examples - skirting boards affected by flooding, delicate artwork frames attacked by woodworm, timbers in moisture sensitive environments (computer rooms, telephone exchanges). Boracol 10RH and Boracol 5RH contain Borate, Mouldicide, Water and Glycol. Apply by brush or sprayer. Non-staining and only 1 hour re-entry. It has no smell and no vapour. 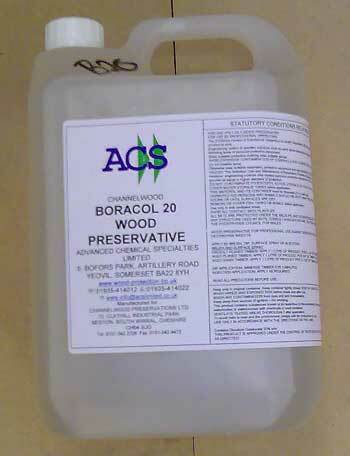 Boracol 20 contains Borate, Mouldicide and Glycol. Apply by brush or roller. Non-staining and only 1 hour re-entry. It has no smell and no vapour. Usage rate - for treatment of light to heavy woodworm infestations. Apply at an average rate of 4 square metres per litre, until wet, but not dripping. Apply two coats (10RH), or 4 coats (5RH) allowing to dry in between. Boron Gel - 500cc, 1 litre and 2 litre - for brushing onto wood or masonry. For DIY amateur and trade professional use at 5% solution in Glycol. Also available as a 20% Gel for professional use. 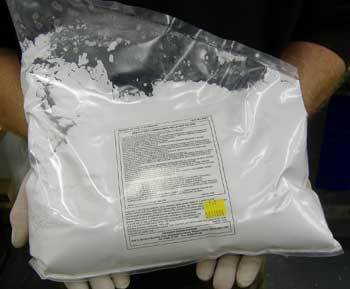 Boron Ultra Gel is a honey-like 5% Borax based liquid. It is to be applied where there are heavy concentrations of insect attack (lots of holes, closely spaced) or to protect timbers from rot attack. It is also available in a higher concentration surface treatment for Death Watch Beetle and active Dry rot. Used for additional protection where the timber has become damp and is more vulnerable to attack by insects and rots, or for new timbers being installed in a damp area. Apply by brush. It can leave white crystals if too much is left on the surface after absorption has completed, so always remove excess with a damp cloth. It has no smell and no vapour. Usage rate - allow about 4 square metres per litre on smooth timber, more if the surfaces are rough. For woodworm and rot prevention treatments 500cc will cover about 2 square metres, 1 litre about 4 square metres and 2 litres about 8 square metres. Boron Paste - 400cc - in a plastic cartridge - for injection down holes into insect affected damp timbers (over 12% TMC) - for Woodworm. For DIY amateur and trade professional use at 5%. Also available at 40% for professional use. Boron Paste being injected into a 10mm hole. 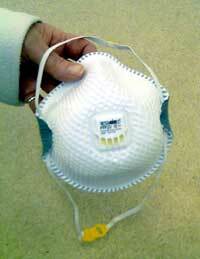 Does not require a Mask - the Boron Ultra Gel gives off no vapour. Boron Ultra Paste is a smooth white paste for use inside timber. 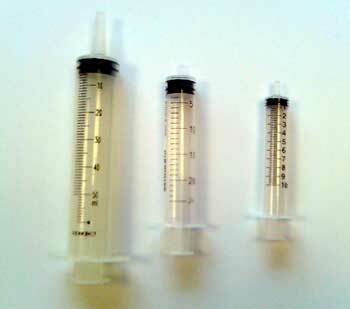 Apply by injection, using the extensive tube provided. It has no smell, but can leave crystals if any is left on the surface - wipe off excess with a damp cloth. It has no smell and no vapour. 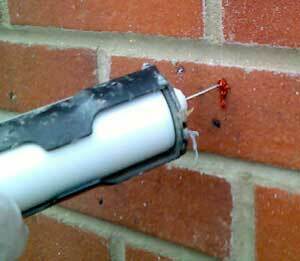 For woodworm treatments and where timbers are damp and are likely to remain damp, or become seasonally damp - e.g. roof timbers, window frames, joist ends, beam ends, wall plates, door posts, garden posts. 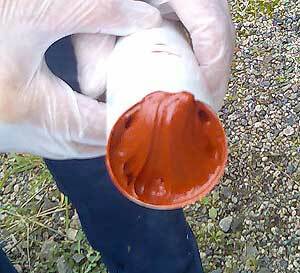 Hole filling - all our injection pastes and creams can be runny when warm and will dry out rapidly in the open air. Use our plastic plugs, or wooden dowel, to cap the holes. Always plug the holes to stop the product from drying out. 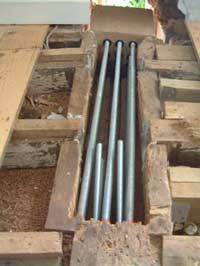 Boron Rods - 8mm x 24mm, 8mm x 65mm - larger sizes available for big timbers. fence posts, electricity poles & railway sleepers. drill holes for Boron Rods and Boron Paste. 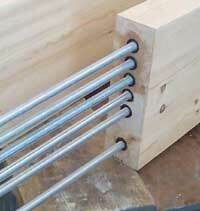 For embedded joist ends, drill angled 10mm diameter holes. 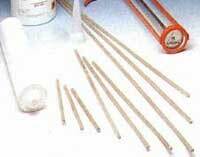 Boron Rods are made of high concentration fused Borate, for use inside timber. They are designed to slowly dissolve inside the wood, spreading a zone of treatment around each hole. They have no smell and no vapour. For woodworm and rot treatments where timbers are damp and are likely to remain damp, or become seasonally damp - e.g. window frames, joist ends, beam ends, wall plates, door posts, garden posts. Provides a long term reservoir of Boron protection - e.g. sheds, fence posts, window frames, timber framed buildings. Usage rate - use our chart of hole spacings for various timber sizes as a guide, or call us on 01626 331351 and we'll calculate your exact requirements. (Hole Spacing Guide - click here to download). 8mm diameter rods to be inserted into 10mm diameter holes with end space of at least 5mm. Sizes - 1 litre, 2.5 litre and 7.5 litre kegs. Prices for Kits - includes the 3 part resin pack, plus a Free Mixing Paddle. Includes: 1 litre of Epoxy Putty, 0.5 litres of Epoxy Primer, Box of 100 Uni Handed Vinyl Gloves, Smoothing Roller. Includes: 10 x 6mm x 1 metre Epoxy Glass Bar, 400cc Thixotropic Resin, 400cc Cartridge Kit, Mixing Knife, Box of 100 Uni Handed Vinyl Gloves, Extension Tube 10mm x 400mm.